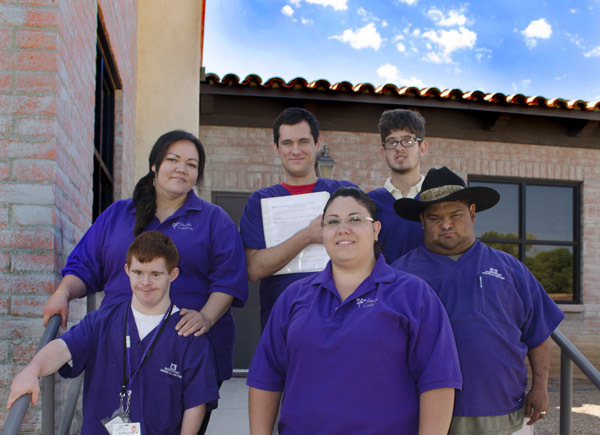 Day Treatment & Training (DTA) – Achieve Builds Confidence, Inc.
Achieve’s focus at the day programs is to use personal living skills training in residential settings to foster independence and self-reliance along with physical, speech, occupational, and sensory therapies. Community integration is encouraged through outings and taking advantage of the many volunteer opportunities in our community. By providing the individuals with structure and routine, meeting their personal goals, allowing them to express themselves, building work ethics, and life and social skills they build confidence. Additionally, developing life-long friendships takes place. The staff and individuals of each site take great pride in their program and enjoy all activities that are offered. Each person is unique and is able to pursue their own interests. Their input in planning is valued and incorporated daily. We celebrate the success of our individuals, some of whom now hold part time jobs in the community. The individuals have the opportunity to participate in a wide variety of cultural events. They visit museums, galleries, parks, businesses, and media outlets throughout Tucson and Oro Valley. In the last year they particularly enjoyed tours of the Newspaper, local radio and TV stations as well as trips to the Reid Park Zoo, The Franklin Museum, the Gem Show, 4th Avenue Street Fair, and the Sweetwater Wetlands. We annually attend the Pima Country Fair, the Rodeo Parade, and the Pumpkin Festival at Buckelew Farm as well as participating in the company wide annual Talent Show, Holiday Party and Peak Achievers, which is our version of the Olympics.